Silver Dollar values are always changing, thanks to the fluctuating silver prices and prevailing numismatic and investing trends in the coin industry. While market conditions may vary from one day to the next in terms of coin values, what remains constant for Silver Dollars are their popularity with coin collectors and rare coin investors. Morgan Silver Dollars and Peace Silver Dollars are arguably two of the most widely collected coin series in the United States today, and they enjoy high demand from both professional numismatists and die-hard coin investors. Knowing the latest Silver Dollar values can help you make wise buying and selling decisions, and here at Coin Values we offer Silver Dollar prices so you can stay on top of what your favorite coins are worth. The prices we provide below are for problem-free coins that grade Extremely Fine-40 on the Sheldon Grading Scale, unless otherwise noted. Of course, coins that are damaged or are in a lower state of preservation will be worth less than the coin values listed here, and those in better condition will be worth more. Also, our Silver Dollar values are usually reflect retail coin values, and are about 10 to 30 percent higher than what a coin dealer might pay if you were to sell your coins. None of the Silver Dollar values here should be considered an offer to buy or sell any coins, as we list this information purely for your education and enjoyment. 1895 Morgan Dollar: $38,000 – Every coin series has a key date, and for the Morgan Silver Dollars, this is by far “the” coin that every collector needs for a complete set, though very few numismatists will ever be able to afford. 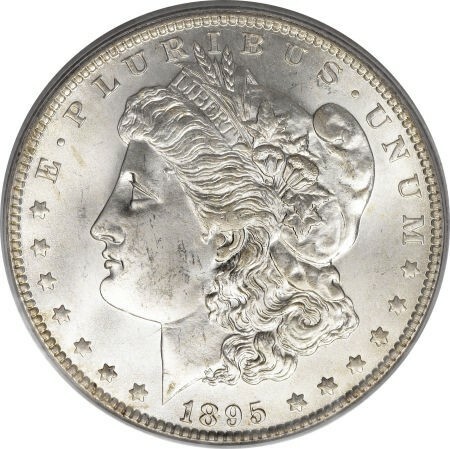 The 1895 Morgan Silver Dollar ranges in value from about $21,000 in Very Good-8 up to about $40,000 for uncirculated coins. Minted only in proof, the 1895 dollar is a rare coin indeed, and one that often ever really shows up in big auctions or at major coin dealer firms. Just 12,880 of these dollar coins were minted, and far fewer survive today. 1893-S Morgan Dollar: $9,500 – This is a regular-issue coin, yet only 100,000 specimens were made. Few survive to this day, and with so many coin enthusiasts out there looking to get their hands on one of these 1893 Morgan Silver Dollars, values are high for an example in any grade. The best advice if you’re looking to buy one of your own? Buy a slabbed 1893-S from a reputable third-party coin grading company. 1889-CC Morgan Dollar: $8,100 – Like the 1893-S, the 1889-CC Morgan dollar is another coin that is purely scarce, though perhaps more numerous than the latter counterpart. 350,000 examples were struck but, again, not all survive as many 1889 Morgan Dollars were melted, and many others were lost to the hands of time. 1901 doubled die reverse Morgan Dollar: $1,850 –This doubled die variety is a popular piece, though often excluded from many date-and-mintmark coin sets as it wasn’t a standard issue. Still, die-hard coin collectors will clamor to get their hands on a 1901 Morgan Dollar, and they are truly among a scarce breed. Be sure to buy a certified example should a 1901 doubled die Morgan Dollar be calling your name. 1893-CC Morgan Dollar: $1,450 – This piece is among the classic 1880s and 1890s Morgan Dollars that were produced in low mintages and are scarce today. As many numismatists know, all Carson City Mint Morgan Dollars are scarce, and pieces such as the 1893-CC are rarer still, thanks to a low mintage in this case of just 677,000. Many were melted so 1893-CC Silver Dollar values are lofty. 1895-S Morgan dollar: $1,325 – Let’s face it, Morgan Dollar collectors, 1895 represents a tough financial hurdle to jump over. All three Morgan dollar issues from that year are on this top 25 most valuable Silver Dollars list, and this is #2. 400,000 specimens of the 1895 Morgan Silver Dollar were made at the San Francisco Mint, and all remain scarce to this day. 1894 Morgan dollar: $1,225 – From another tough year, 1894 Morgan Silver Dollars are expensive in any grade, including Extremely Fine-40 on the Sheldon Grading Scale as evidenced here. Only 110,972 were made – a tiny mintage by any measure of United States coin – and few remain today. Beware of counterfeits, and buy only certified 1894 Morgan Dollars. 1903-S micro “S” Morgan dollar: $1,150 – This mintmark variety is considered highly scarce, and while often not included in a general date-and-mintmark Morgan dollar set, this 1903 Morgan Silver Dollar variety often finds its way into the homes of Morgan enthusiasts. 1879-CC Capped “CC” Morgan Dollar: $640 – Like many of the minor Morgan dollar varieties listed among these top 25 most valuable Silver Dollars, the 1879-CC Morgan dollar is usually not a top item for casual collectors of the Morgan series or even those looking to assemble a basic date-and-mintmark set. Enthusiasts, however, will add this 1879 Morgan Silver Dollar variety to their collections since they represent the interesting minting peculiarities of the Morgan dollar series, which often seem similar to the multitude of die varieties found among the early Silver Dollars. 1885-CC Morgan Dollar: $610 – A scarce coin solely because relatively few were struck. It had a mintage of just 228,000 and many of the coins were later melted, accounting for the high value of this 1885 Morgan Dollar variety. Morgan Dollars from the Carson City Mint, like that from 1885, are a favorite item for coin collectors.